Ever since Marco Polo returned from China and the account of his journey was published, the resulting demand for the spices and the “high tech” goods of Cathay drove an impulse to find a safe trade route to the pepper, silk and gunpowder that Polo brought back. After the Ottoman Empire closed the Silk Road in 1453 the major powers of Europe began seeking another way to the East. When Christopher Columbus, who had read Marco Polo’s book carefully, sailed west from Spain in 1492 he was trying to find another trade route to China. He was not the only European to be disappointed to find an entire continent blocking the water route to the East. 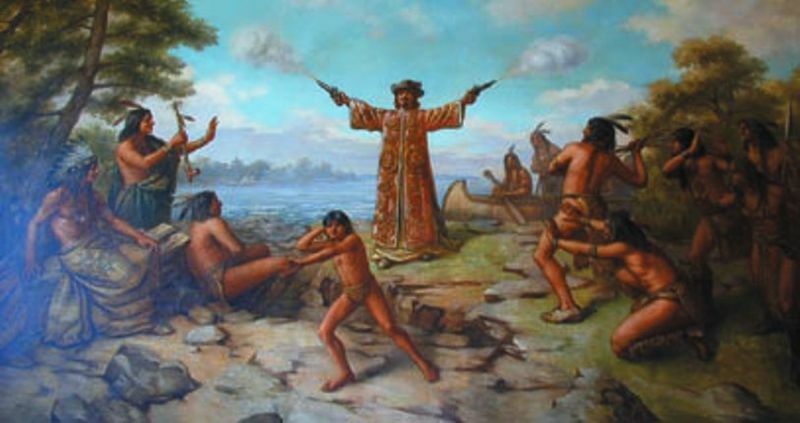 In 1634 the French adventurer and explorer Jean Nicollet landed near modern day Green Bay, Wisconsin. Even though he had been living in Canada for 16 years, he thought he was landing in China! He heard the people living there ate rice and concluded that if they weren’t the Chinese, they must be close. Upon stepping ashore he wore a silk damask gown and held a pistol in each hand to impress the natives that he was a nobleman and a warrior. The native Ho-Chunk tribesmen were only frightened. They did however, have a better idea of where in the world they were.